A few months ago I finished Far Cry 4. It’s an open world, first person shooter set amidst political change in a fictional Himalayan country. In the course of shooting everything that moves, your character becomes entangled with The Golden Path, a group of rebels trying to overthrow a very well dressed and oddly charming dictator. Two people struggle for leadership of The Golden Path: Amita and Sabal. Amita is harshly pragmatic but socially progressive. She wants better rights for women, for example, but she’s willing to fund the revolution by selling opium. Sabal, on the other hand, struck me as staying closer to the middle of the road. He was charming and had boundless compassion for his fellow soldiers, but he also wanted to maintain a cultural heritage that includes traditional social castes. Just kind of milquetoast, especially next to the extreme highs and lows of Amita’s agenda. As a player, this is an interesting choice. Both Amita and Sabal have good and bad qualities by my standards. Yet completing the game eventually required me to take a stand and support one leader over the other. I deliberated carefully when the point of no return came, but I made my choice as to who the story’s main character would back. 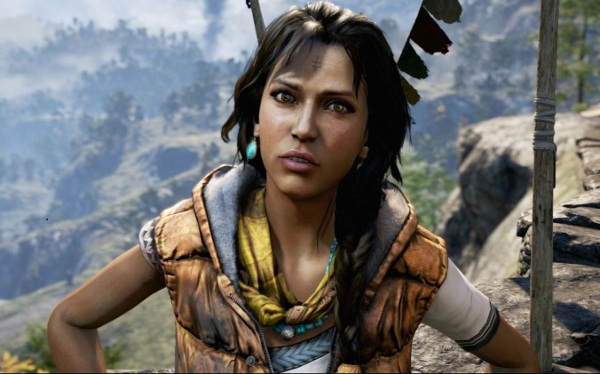 I chose Amita for what it’s worth, though I really liked Sabal’s character and felt kind of bad about it. After that choice was made, though, I was all in. I started thinking about what Amita was fighting for and how it aligned with my values. She was for progress, right? Progress is good. Let’s just ignore that time she wanted to let her fellow soldiers die so that I could instead pursue some valuable information. And that whole “Let’s fund a war by controlling the opium trade” schtick. SHANGRI LA LA LA! I CAN’T HEAR YOU, AMITA. In their paper, the authors observe that we often fall into “reason-based models” of decision making, where we search –sometimes retroactively– for reasons that support the choice we make. As opposed to a rational approach where we assign values to all options and outcomes and just leave it to math. This reason-based approach makes us susceptible to framing effects and the nuances of language when we are presented with a choice. One example is being asked to either “choose” or “reject” one option out of two that have equal value. Choice A and Choice B differ across a few dimensions, but those differences cancel each other out when taken as a whole. All things considered, A and B are of equal value. If that’s true, then “choosing” one of the options should be the same as “rejecting” the other. Imagine that you serve on the jury of an only-child sole-custody case following a relatively messy divorce. The facts of the case are complicated by ambiguous economic, social, and emotional considerations, and you decide to base your decision entirely on the following few observations. Look at those lists and you’ll see that Parent A is just kind of average. No great qualities, no bad ones. Parent B, though, has some great qualities (above average income, very good relationship with the kid), but also some bad ones (travels a lot, health problems). They are, in this way, somewhat like Sabal and Amita. The researchers, having split the subjects into two groups, played with the phrasing of the choice to see how our reason-based approach to choosing between similar options could be used to nudge things toward one parent or the other. They asked either “To which parent would you award sole custody of the child?” or “Which parent would you deny sole custody of the child?” (Emphasis mine in both cases.) If the choices were equal –or even approximately equal– then the phrasing shouldn’t matter, right? Well, it did matter. When asked whom to award custody to, 64% of the subjects saw Parent B as the better choice. But when asked whom to deny custody to, the preference flipped and only 45% chose to give Parent B custody. Why? Because the words “award” or “deny” set off searches for justifications for those decisions. People looking for a reason to award custody zeroed in on the higher income and good parent/child relationship of Parent B. And those looking for a reason to deny custody zeroed in on that same person’s health problems and travel schedule. The phrasing of the decision biased them towards paying attention to and using certain information. And so it may be with Sabal and Amita. If I recall, the tutorial text for the game tells you to “Choose who to support” when Amita and Sabal at are at loggerheads. Would I have chosen differently if it had said “Choose who to betray” or “Choose who to reject”? Maybe. Point is, if you’re a game designer presenting the player with a big decision, your choice of words matters. And if you’re a player, try looking at things differently simply by rephrasing the choice before you pull the trigger. 1. Eldar Shafir, Itamar Simonson, and Amos Tversky (1993). Reason-Based Choice. Cognition, 49. 11-36. doi:10.1016/0010-0277(93)90034-S.
2. Shafir, E. (1993). Choosing versus rejecting: why some options are both better and worse than others. Memory & Cognition, 21, 546-556. ← Podcast 9: How Do Games Differ From Other Media? 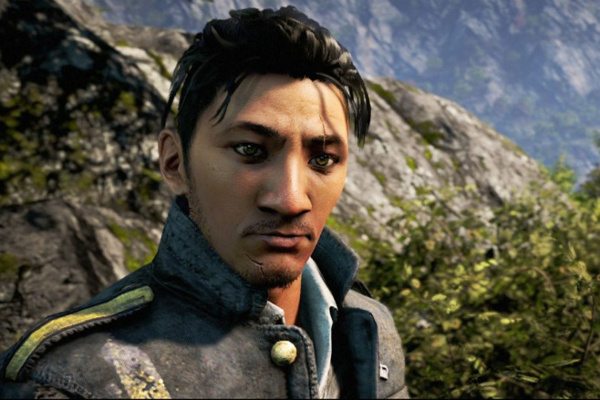 I’ve finished Far Cry 4 a weekago and I too paid attention to the choices it presents. However my experience was slightly different from yours. 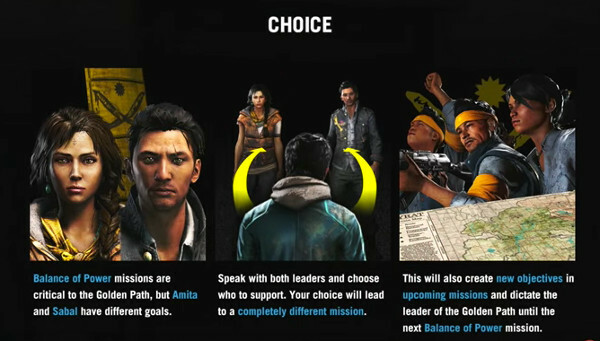 In a nutshell, FC4 forces players to choose between Sabal and Amita 3 times. The first one is like this: there are two good characters that mean well for the country and fight for the right thing and I was choosing whom to SUPPORT. However as the story unfolds, both Amita and Sabal start to seem more and more selfish and corrupt. For me, the second choice was not about supporting any of the charachters, but about CONFRONTING the other one. The third and final one was the most interesting. To me it was like “I do not like both of them – they are both evil manipulative pricks and cause more harm then good. I’d rather kill ’em both!”. And Pagan started to look like not-that-bad-of-a-dude (btw I still killed him cuz I got tired of being manipulated by everyone – and I still regret this). Yeah I know what you mean. It became rather morally ambiguous towards the end. It’s really strange, I supported Amita all the way until the end, but when I was tasked with killing her I didn’t. I also spared Pagan.